This is just a little collection of thoughts on the difficulties of manuscripts, something to start us off so that we can cast them aside! As many of you will have noticed from the manuscript image we have used in the poster (generously allowed by Carol Hughes), Ted Hughes’s writing is expressive, which is sometimes a generous word for ‘unreadable’. His editor at Faber Christopher Reid effectively described it as “galloping” (xii). In his editors introduction to Hughes’s collected letters Reid writes that although he has ‘silently’ corrected some spelling mistakes in the letters to avoid littering the text with [sic], he has left unchanged unusual spellings which he believes to be “stubborn eccentricities” (xiv). For example ‘develope’ -which Microsoft word keeps autocorrecting adding a modern twist to the idea of ‘silent’ editing an idea which I’m sure will be contested throughout the conference! 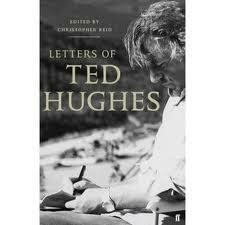 Clearly here Reid is influencing the presentation of Hughes in his own letters and so as a topic of interest, how much of Reid is now present in The Letters of Ted Hughes and could Hughes simply not spell?! To avoid becoming too dull and technical and listing every occurrence where Hughes took on English spelling single handed, I am going to move on to what Hughes himself thinks of manuscripts. Early on in his writing career Hughes used the sale of manuscripts to support his young family. Aside from a monetary value, however, Hughes was fast to realise the potential for literary understanding. In 1968 he wrote an introduction to Emily Dickinson’s verse which was emphatic in its defence of the importance of retaining her original punctuation. The dashes for which she is now famous, were often edited into ‘normalised’ punctuation, yet another example of that secret/not-so-secret editing hand and the importance of the original manuscripts. Hughes writes “Emily Dickinson’s eccentric dashes are an integral part of her method and style, and cannot be translated to commas, semicolons and the rest without deadening the wonderfully naked voltage of the poems” (154). Later, as Hughes headed towards the major sale of 2.5 tons of papers to Emory University in Atlanta, he reflected again on manuscripts and their use in analysing poetry. He wrote an essay ‘The Evolution of ‘Sheep in the Fog’’ which progresses through Sylvia Plath’s drafts of this poem examining the “depth charges” which resonate through this poem. The final piece does not contain explicit references to mythologies such as Icarus which are only present in early drafts. In the final word choices of this poem Hughes finds resonances of these abandoned mythologies which he believes gives this poem its eerie overwhelming significance belying its apparent simplicity. I would certainly suggest reading the essay which contains facsimiles of her drafts to follow along with his argument. Whether you agree with Hughes’s assessment of Plath’s poem or not, it is interesting to examine the technique of how he gets to grips with navigating the pathways of someone else’s words. Putting aside whether you support Hughes’s reading or technique, even the representation of a manuscript in a typed critical piece has been a topic of much debate. Tim Kendall in his book Sylvia Plath: A Critical Study represents her manuscripts in the following way: “Red, mottled, like cut throats/ The throats of Jews.” (the part in bold actually had a strikethrough, but that didn't work on here) (112). Kendall allows the reader to grasp the development and mutation of Plath’s thought throughout the manuscript and, like Hughes, uses this to elucidate the affect of her final word choice in the finished poem. Kendall touches on the moral issue of representing a manuscript which is not the final version the author intended to be seen. He notes that Plath’s removal of the image quoted above is “fortunate” as it is “potentially offensive” (112), and yet now readers have access to such material. The ethics of Hughes’s action of destroying certain Plath papers and the ethics of examining a literary estate when it has been placed in a public collection are topics of high controversy. If the moral issue is pushed aside, Kendall’s visual representation of Plath’s drafts could be perceived as problematic. A single line strikethrough does not give adequate representation to the vehemence of some of Plath’s scribbling out, nor does it acknowledge the ambiguity created by Plath’s use of arrows or the presence of two words squashed into one space. This kind of representation prompted Susan Howe’s semi critical, semi poetic book The Birth-mark: unsettling the wilderness in American Literary History. Like Hughes, Howe examines the treatment of the papers of Emily Dickenson in scholarship and finds their representation unsatisfactory. She takes the debate further, however, by arguing that there is intention behind all the marks on the manuscripts and that even the angle of one of Dickenson’s dashes can bring new meaning to a poem. She sees the normalization of Dickinson’s punctuation as a kind of violence against the original. She negotiates this problem by reproducing photographs of the manuscripts, and where using typed versions she photocopies Dickinson’s handwritten marks in between the typed words. Here I have attempted a very brief indication of a few of the issues that surround the topic of this conference – so called ‘silent’ editing and how influential this unseen editing is, the validity of tracing authorial intention through poetic drafts, and difficulties in the visual representation of manuscripts and the potential for ‘violence’ to the author’s intention. Lisa and I hope that these pieces will provide a start point for discussion about the conference and provide some interesting background to the papers. Please email in to either of us a piece from 500 words upwards! And feel free to comment and start discussion! Hughes, Ted. Winter Pollen. London: Faber and Faber, 1994. ----------------- Letters of Ted Hughes. London: Faber and Faber, 2007. Kendall, Tim. Sylvia Plath: A Critical Study. London: Faber and Faber, 2001.